Top tips for keeping your washroom in pristine condition! Home » Blog » Top tips for keeping your washroom in pristine condition! As a business owner, keeping your washroom clean and hygienic will keep both your customers and employees happy. Do you know how McDonald’s became such a popular choice for Americans during the 1950’s? One of the reasons was their clean and hygienic washrooms! The founders of McDonald’s found that their competitors’ toilets were often dirty, and then took measures to ensure that all of their washrooms were safe and hygienic. This proved to be a big hit, as customers who needed to use the loo whilst travelling would choose McDonald’s over its competitors because their washrooms were cleaner! I’m sure everyone has been into a washroom that smells absolutely terrible! Don’t make the same mistake and ensure that you have an eco-friendly air freshener in the washroom to block any foul odours. You want to get an air freshener that works 24/7 and doesn’t just mask odours, but dissolves them completely. The Oxy-Gen Powered Air Freshener uses a passive air system that is completely emission free and provides a longer-lasting and more effective fragrance than its aerosol-based counter-parts, which contain VOCs and propellants. You don’t want to constantly refilling your hand towel and toilet paper dispensers with more paper. Also imagine if you were the customer who ran out of toilet paper while in the washroom! Toilet paper dispensers now come in a double jumbo size – meaning the rolls are longer and each dispenser holds 2 rolls – lasting much longer! Recycled toilet paper and hand towels are not only 100% better for the environment than regular paper, it is also more cost effective. This suits washrooms with high amounts of traffic. When purchasing recycled toilet paper and hand towels, look out for ones that are made in Australia from 100% post-consumer waste and have no bleach or fragrances added. You will definitely want to ditch liquid soap for foaming soap after hearing these benefits. 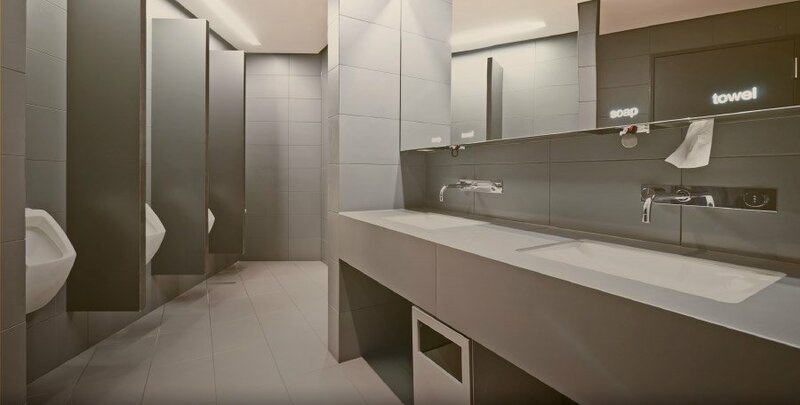 Similar to recycled toilet paper and hand towels, foam soap is better for the environment, is more cost effective and suits washrooms with high traffic! Foam soap is a diluted version of liquid soap, and industry studies show that foam soap uses 16% less water on average than liquid soap. Foam Soap dispensers also release less soap than liquid soap dispensers, whilst making the same amount of soap last longer – and still achieving the same level of cleanliness! When looking for an all-purpose washroom cleaner, use one that is 100% biodegradable, safe for people, plants, waterways and all waste systems. Greenheart Washroom Wizard is a great eco-friendly all-purpose washroom cleaner that can be used on a wide variety of surfaces, such as restroom facilities, waste drains, toilets and both waterless and flushing urinals. It is also free of propellants and allergens, and is 100% eco-friendly. So there you have it! Our top tips for keeping your washroom eco-friendly and in pristine condition! Our natural, toxin-free washroom accessories are kind to your skin and kind to the environment, whilst also being super effective. For more information on our range of products and how we can help you keep your washroom in tip-top condition, please contact us today.